My guess is that many of you are in the same boat as me. 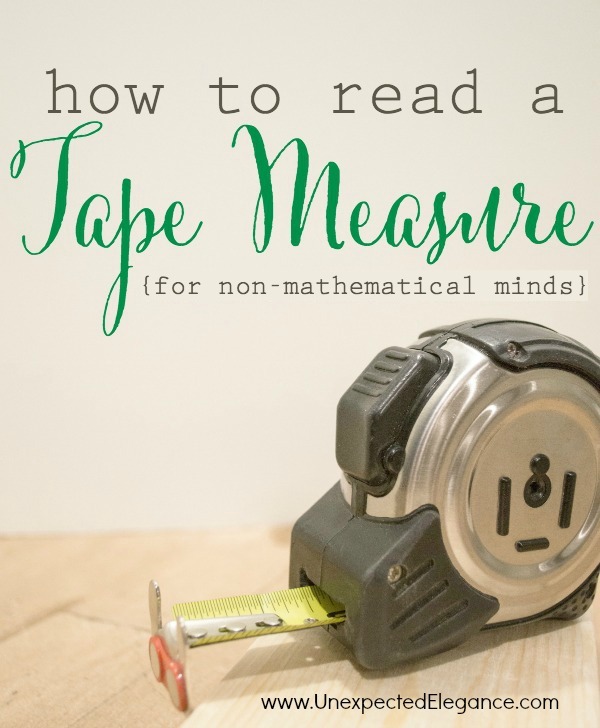 So, I thought we could do a little: How To Read a Tape Measure 101. This is what helped me, seeing it broken down…I’m a visual learner. Every single line on the tape measure can be broken down into 16ths. This little bit of knowledge is what I was missing. 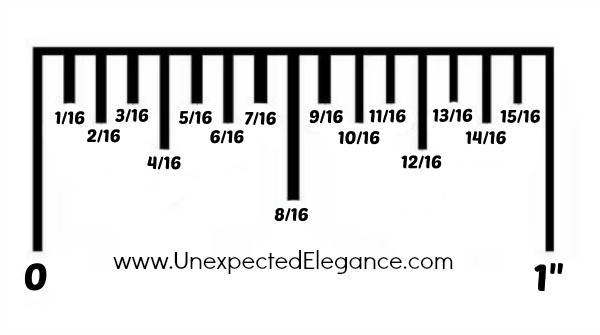 The 16ths can be reduced into 8ths, like the picture above. Makes sense right? And those 8ths can be broken down even more, until you get to 4ths and a 1/2. If you look at the picture below you can see how this all makes sense. 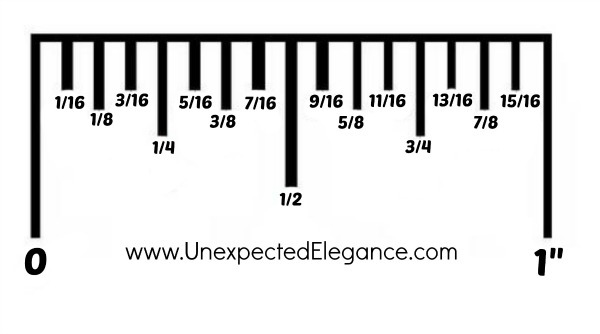 Shortest lines are the 16ths, going up in length to 8ths, 4ths, 1/2 and inch. 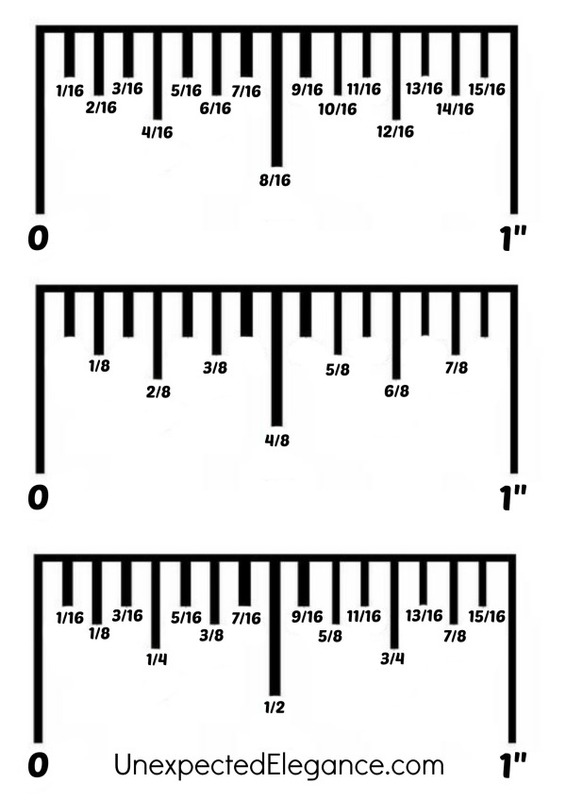 I realize this is simple once you break it down, but in order to be able to measure something and spout off the CORRECT measurement without counting the lines every time (maybe it’s just me) I need it to be broken down. Since we are on the subject, I though you might like to know about this particular QuickDraw Self-Marking Tape Measure! It makes marking off cuts a piece of cake (or so they claim)!!! I ordered one but it’s on back order so as soon as I get it, I’ll share my findings. I totally have been needing this info! I get so frustrated when doing projects that require careful measuring! I put up some board and batten this Fall and the measuring was a nightmare! So glad to have your post to help me next time! You are so dull. Metric is the system of reason and universitality. I need to make your visuals into signs to put into our workshop. My husband gets so frustrated with how long it takes me to count and then reduce the fraction in my head to tell him a measurement. Our shop teacher at school also might appreciate this post. He works really hard to teach this skill to kids. I use metric in my science classes which is so much easier!! This is too funny. I’m in the same boat and thank you for this post! What’s even funnier? I sew. Have sewn for over 40 some odd years. I hate math, so i’ll be checking this OFTEN. It’s amazing how many of us have been using a tape measure for years and never REALLY knew how to properly read it. :/ BTW, I just added a printable visual to the post, in case you are interested. Hey, this is a great idea, wish I would of thought of that. I sure beats having to write it 1,000 times. This is soooooo me! I giggled through your first paragrah. I always tell my huby that it is 32 and 3 blips. He than asked 3 big or little blips! He has explained numerous time snad I still can’t or don’t want to memorize the measurements. 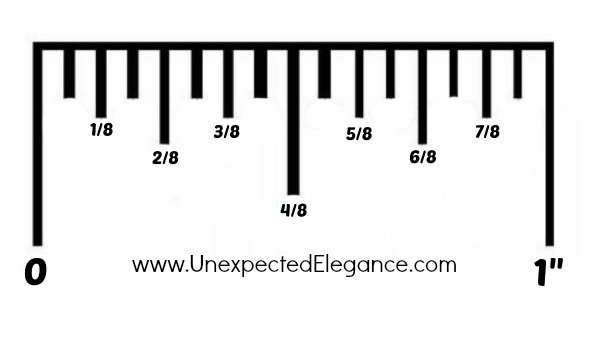 I did find a measuring tape that has all the 3/16 etc. right on the measuring tape, Genious! we both did this without knowing the other one did too’! Thank you for this!! Hi Angela, I’m a Mathematician and an avid Woodworker — if it makes you feel any better, I do know how to read a tape measure but usually just stick with the 32″ and 3 little lines approach. My Dad always did it that way when I was a kid and I still find it easier — especially when communicating with my wife. This is great. I never knew hot to use and really needed to teach my son for a job. This really helped us both. Thank you! Hope I am not too late to join in on the Thank you, thank you bandwagon! I so needed this! This is a HUGE help! Thanks for dumbing it down. Thank you so much for wisely explaining this troublesome subject for me. I struggle basically all my life not been able to measure with confidence. You are a life saver! I’m so happy to get this information. Thank you. This is much better, but am still a bit confused. I hate math and flunked every course in high school. I never learned fractions or algebra or geometry. I can do simple fractions but very simple. Measuring must be geometry and thst is far out of my ballpark. I can do inch, half inch, and quarter inch but after that is too far out there. Is there an easier way? Doing a bit better but would never be able to simply read a tape meadure by memory. The larger lines yes but smaller will always need to be studied and counted and still may not get a measurement right. I realize unless good at math this is only minimally helpful and those like me will never be good at math. I only wish those that write these understand that there will always be some who still cannot grasp it. To assume everyone is into difficult msth is not helpful. This is basic math. I guess I just took it for granted that people understand how to read a measuring tape . Basic fractions. This is a very good explanation for those who didn’t know though. Thanks for this! I never knew until recently when I needed to learn it for a job. I’m not sure how to do it without just memorizing though. Guess I need to look up fractions for dummies next.